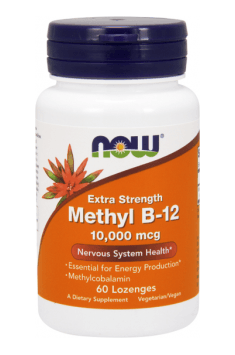 Methyl B12 (methylcobalamin) is the most effective, the most readily absorbed form of vitamin B12. As the only one it exceeds the blood-brain barrier. Her methyl groups stimulate the production of serotonin a neurotransmitter, which is responsible for mood. It also works directly on the brain cells, protecting them from toxins. It neutralizes homocysteine, which has an adverse effect on the diseases of cardiovascular system, contributing to atherosclerosis, thrombosis, myocardial infarction, stroke. The methyl groups in the preparation activate hundreds of chemical reactions in the body. Vitamin B12 is also responsible for the proper functioning of the nervous system, due to its activity in the biosynthesis of nucleotides and choline which is a part of the myelin sheath that surrounds nerves. Vitamin B12 belongs to the group of water soluble vitamins, and therefore, it is not accumulated in the body, but is excreted in the urine and sweat. To ensure the appropriate its level, it should be complemented. You can not overdose on the other hand. Methyl B-12 10.000mcg 60 tab. Vitamin B12 is good for mental health - it improves mood and increases resistance to stress. Deficiencies of this vitamin are very common - it is estimated that only ten percent of the population has proper levels. Due to the fact that it naturally occurs mainly in animal products, its supplementation is a must for vegetarians and vegans, but considering all the health promoting properties of vitamin B12 it should be taken by everyone. When planning supplementation take into consideration both your dose, as well as its form, because the absorption of vitamin B12 is a complicated process. I recommend vitamin B12 in the form of methylated (i.e., methylcobalamin) - optimally is to take 1 tablet (10,000 mcg) per day. Vitamin B12 is difficult to overdose. It dissolves in water and is rapidly cleared from the body. You should know that the absorption of vitamin B12 very improves contained in the popular spice - black pepper, piperine. Vitamin B12 should also be combined with calcium, which improves its absorption. If you take vitamin C, be sure to keep an hour break between Vitamin C and vitamin B12. Vitamin C weakens the absorption of B12.